Alligator Sweatshirt Alligator sweatshirt print is for both light and dark shirts, under our wildlife and animal tee shirt section. 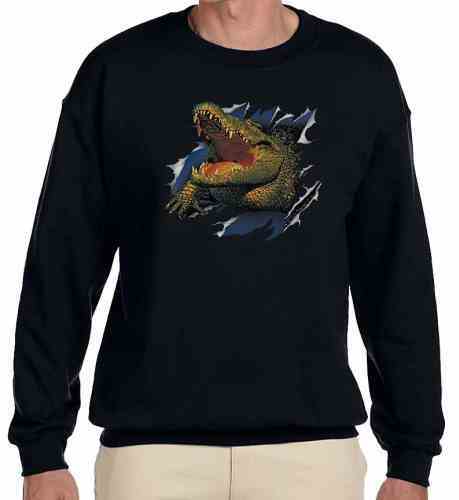 This is a great nature sweatshirt and makes a great gift for anyone who loves alligators or crocodiles. This sweatshirt comes in your choice of four colors for the sweatshirt and up to a size XL. Our alligator sweatshirts are first quality tee shirts and made of 50/50 cotton poly blend. Our wildlife sweatshirts are incredibly comfortable and made to last. If you have questions regarding our Alligator sweatshirt or any of our other wildlife merchandise, please email us with the product name and number.